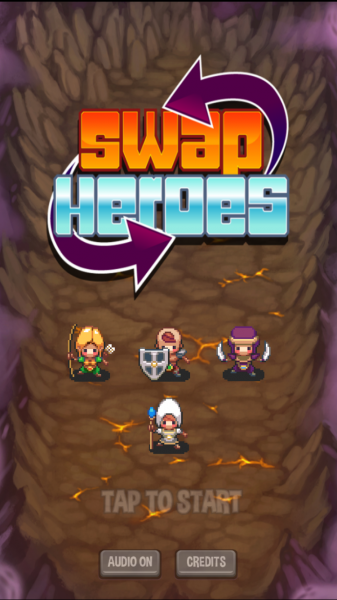 Swap Heroes ($0.99) by Christopher Savory is a casual turn-based strategy game that should appeal to the masses. If the majority of strategy games out there are a bit too frustrating for your tastes, then this one is a nice alternative. It falls into the same kind of category as other games likeTerra Battle and Little Raiders: Robin’s Revenge, but less stressful. 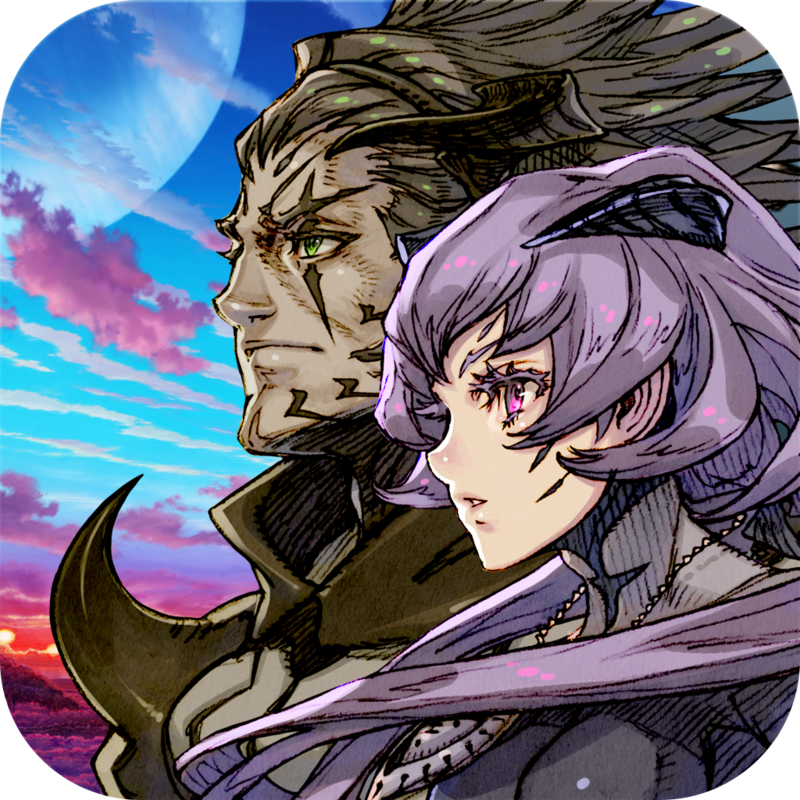 To be honest, strategy games are not my favorite — I just don’t strategize enough (Terra Battle is a big exception as of late, though). So because I’m not the best person to come up with amazing strategies, I’m not exactly enthused when I hear about a new strategy game. However, I was drawn in with Swap Heroes because it seems to be a bit more lax than other titles in the category, so I decided to give it a try. 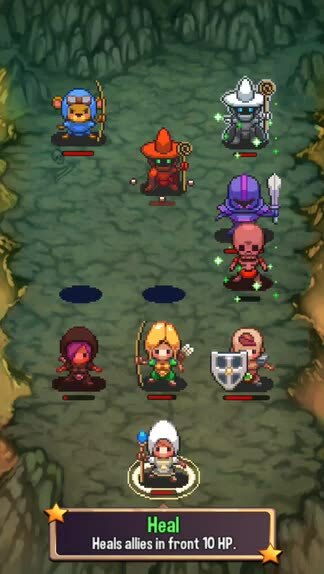 The visuals in Swap Heroes are beautiful, as it has a classic 16-bit look and feel to them. While it is retro and pixelated, the game still has a lot of detail when it comes to the colorful and lush environments, as well as the character sprite designs. 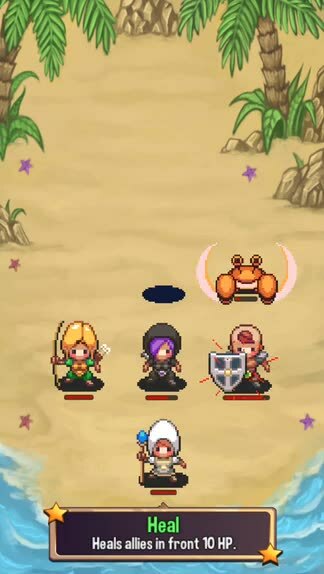 Every monster and hero has their own unique appearance, and I found everything to be pretty cute and family friendly. The animations when you move and attack are smooth and fluid, so I had no lag on my iPhone 6. 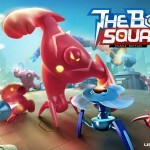 The soundtrack is adventurous and fun to listen to, surely helping you get in the mood to take on the baddies. 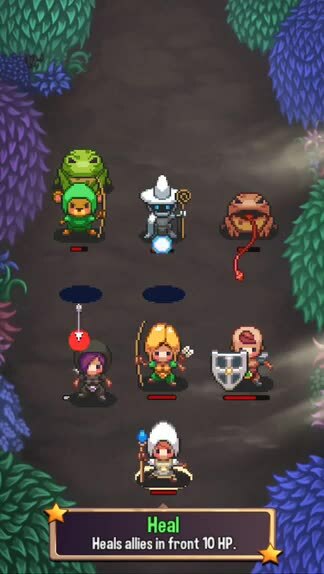 Swap Heroes is an adventure game at heart, so you will set out on a journey through areas of increasing difficulty, with different types of powerful enemies in each sector. You’ll have to go through everything in order, from start to finish. If one member of your party dies, then your whole group fails and you will have to start over. It’s a bit like a roguelike, in that matter. 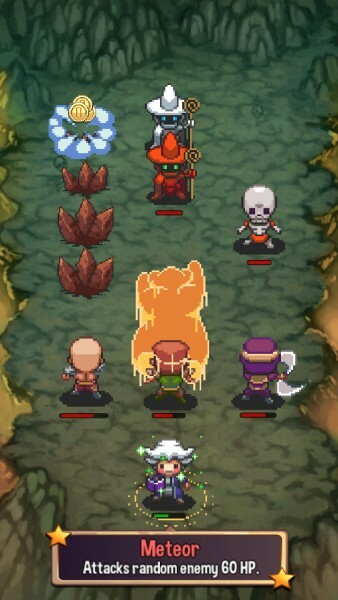 Each level has a wave of enemies, and your job is to clear them all out. 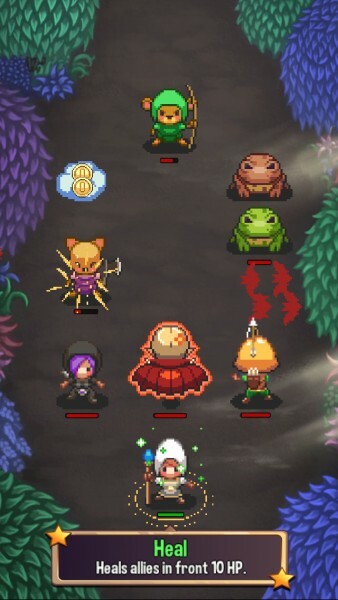 So how do you fight in Swap Heroes? It’s turn-based, so on every turn, you swap two of your four characters in order to have all of them attack in the front row. There is one character that is in the back row, and instead of a basic attack, they will use their skill when swapped back to the front. Putting a character in the back also regenerates their health over time. The skill can be healing, earthquake, draining health from enemies, and much more — it depends on the class that the character is. Your party heals between waves, which is great. 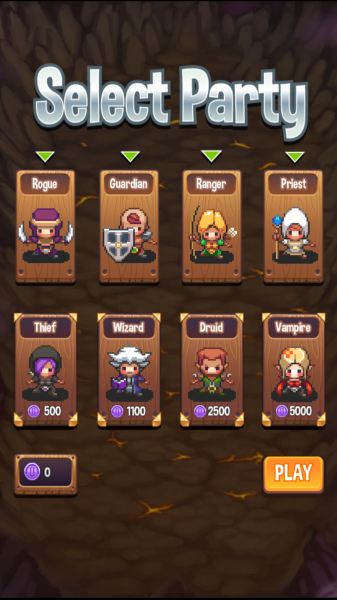 There are eight characters that you can use in your party, though the better ones, such as wizard and vampire, need to be unlocked with purple gems. These gems are earned by completing a run with your party, so they are fairly easy to accumulate if you play enough. Once you have more than four available characters, you can start mixing and matching your group by tapping on who you want to remove and who to take. 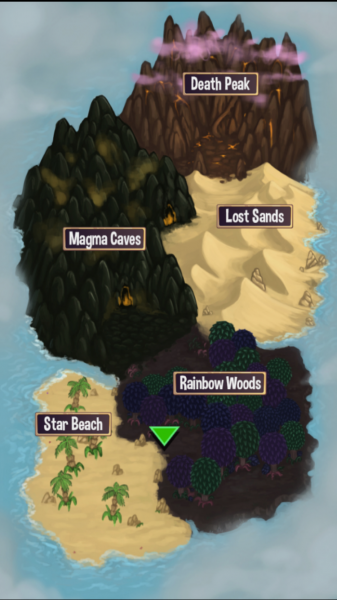 In-between waves, you will have upgrade opportunities with the gold that you earn from defeating foes. There will be an upgrade available for each member of your party, but unless you’ve been saving the coins up, you can probably only get one or two upgrades, depending on the price. These include more health, stronger skills, higher attack power, and more. For those who like hoarding achievement points, there is full Game Center integration for five achievements, but no leaderboards as there is no point system. 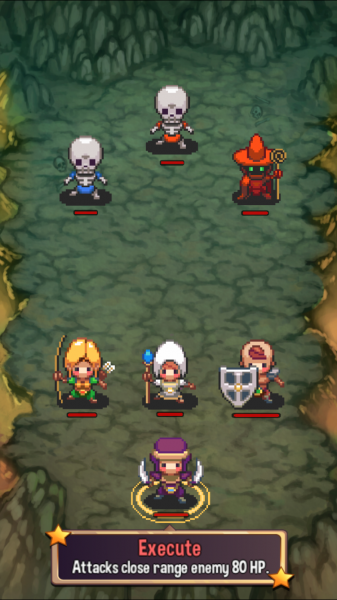 Swap Heroes is a fun, casual take on roguelike strategy games, and I greatly appreciate that. The games are quick and the gameplay mechanic is interesting while being easy enough for anyone to understand. The vintage graphics are a nice touch as well, and the music is delightful. 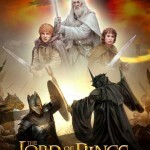 I’m enjoying it so far, and I’m not the biggest fan of strategy games. 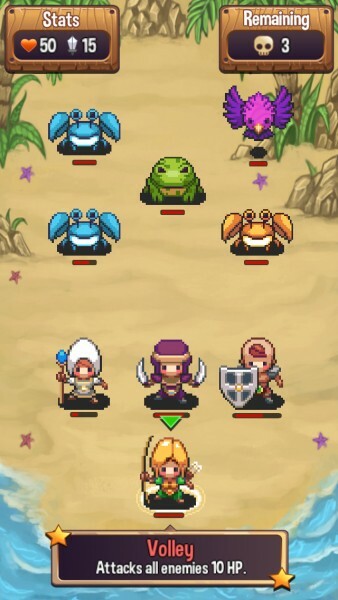 I recommend checking out Swap Heroes if you want a more laid-back, turn-based strategy game to check out this week. You can find it on the App Store as a universal download for $0.99.